I'll admit, I was quite looking forward to this. I like reading classics and I like reading foreign literature, so this should be right up my alley, seeing as it ticks both boxes. That was until I figured out that it shares a problem that I highlighted in my review of Pamela. 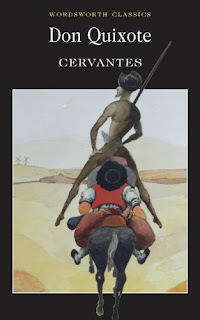 Don Quixote follows the misadventures of Don Quixote de la Mancha, a wealthy landowner who deludes himself into thinking that he is a knight-errant after he reads too many courtly romances. It's meant to be a satire of the courtly romance genre, which was so popular at the time. The problem with this is that, for me at least, the satire fails by not being amusing. There is a reason for this: it's the one that I alluded to in the introduction. My main problem with the events depicted thus far is that they're utterly horrifying when you consider them with a modern perspective. The protagonist is a mentally ill person who lets himself loose upon the countryside and potentially ruining many people's lives. Here's an example that sprang to my mind: you see the hat that he's wearing in that book cover up there? That was the spoils of charging at a barber surgeon, totally without warning, with a lance; if you think of that in more modern terms, that's the news story when someone gets attacked by a crazy homeless man with a knife after he decides that he's taken a liking to the traffic cone that the victim decided would be a good idea to wear after a party. That's far from the worst of it either: he tramples an entire herd of sheep because he thinks that they're a pagan army in one instance, and in another he sets loose a group of convicted criminals. Am I just supposed to forget the consequences of his actions here? For all I know, that flock of sheep was someone's only means of sustenance and those criminals could have wreaked havoc following their release. I fail to see what I'm meant to find funny here; certainly, it's absurd, which can count for comedy, but in this case it's just sad to watch the delusions of an old man who has no idea what he's doing.